Work has started dismantling the motion so that the wheels can be removed from the frames. 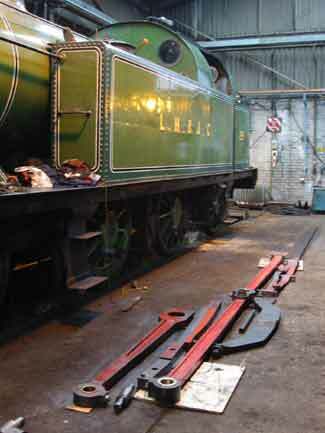 Once removed the wheels will be sent away for new tyres and the motion will be fully overhauled at Grosmont workshops NYMR. Left hand side coupling rods, crosshead slippers, slide bars, left and right hand side eccentric rods and brake table / cross stretcher removed. 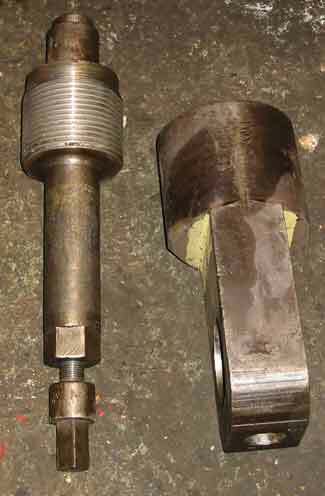 It was not possible to split the left hand cross head from the piston rod using "wedges" despite appling heat to the crosshead. 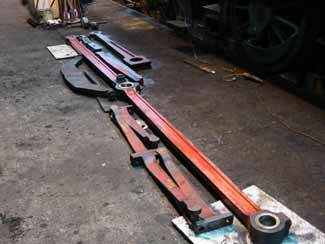 The way forward is to use a crosshead splitting tool which requires the slide bars to be removed. 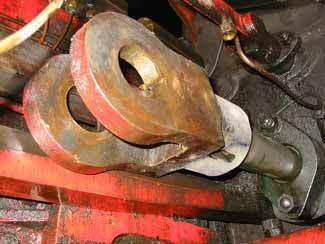 This photograph shows the left hand crosshead and piston rod after the slide bars had been removed. 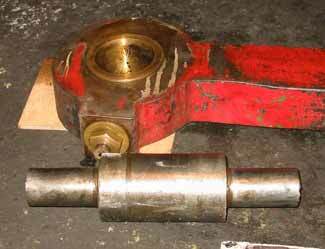 Left hand small end bearing and gudgeon pin. Considerable wear was found on the gudgeon pin, this will have to be renewed.